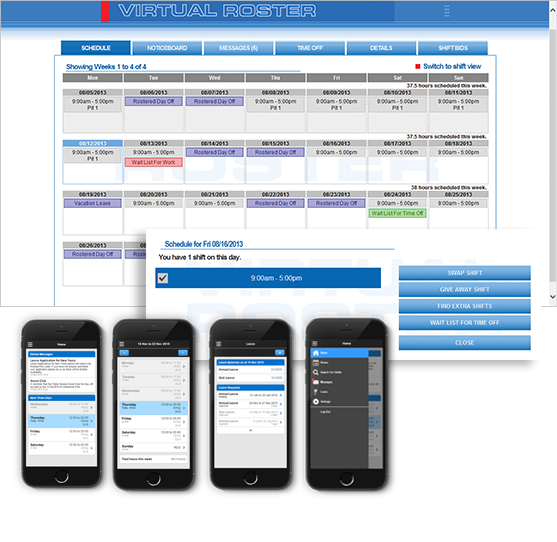 Virtual Roster is a world class casino resort scheduling solution. All departments across the property can utilize Virtual Roster scheduling software to create and manage accurate and cost effective schedules. Allocate the right team member, to the right work at the right time. Fast schedule generation, streamlined daily operations and actionable workforce reporting. All of the important company, department, employee and work information is at your fingertips. Virtual Roster Standard is the foundation module of the Virtual Roster suite. Virtual Roster Standard provides you with an easy to use interface and standard Windows operations. Scheduling staff will use Virtual Roster Standard to create draft schedules, generate reports, publish schedules, manage daily operational changes, cost the schedule, check budgets and many other critical scheduling tasks. Virtual Roster Standard provides manual and semi-automated scheduling tools and over 70 standard reports. Address the challenges associated with staff requesting and taking leave. Virtual Roster’s Leave Manager module is a very effective tool built to address the challenges associated with staff requesting and taking leave. Leave requests can be entered directly into the system by the Virtual Roster operator or by the employee using our web enabled Employee Self Service module. Leave requests can then be approved, denied or escalated by the user or management. Auto approval can also be activated if required. Leave Manager is even able to consider and assess all leave requests using a set of Leave Quota rules. Using this automated leave management module will ensure that your business is always covered with the right number of people with the right profile including skills. Leave Manager can also forecast the amount of leave that a staff member will have at the time of the request and can use this to help make a decision about the request. A range of Leave Reports are available with Virtual Roster and every employee has a Leave Overview screen which provides a color-coded snapshot of the employees attendance record over the last 6 months. Automatically generate optimized schedules using the data stored in Virtual Roster. Auto Roster automatically generates optimized schedules using all of the data stored in Virtual Roster. Workloads and employees will be matched together very quickly whilst ensuring that all relevant company policies and workforce agreements are being followed. Auto Roster takes a huge variety of parameters into account when it generates a schedule including labor standards, employee availabilities, skill sets, costs and many more adjustable parameters. Every department is able to configure the Auto Roster engine so that it replicates their unique required scheduling logic and sequencing. Develop a schedule designed to suit the unique requirements of your gaming floor. The Floor Planner module enables the casino operations team to develop a schedule based on the physical and spread requirements of the gaming floor. The users can then work with the system on a day-to-day basis through this module to better cope with the changes that may occur on the floor. Floor Planner automatically creates the required workloads based on the attributes and opening times of the tables. Once the schedule has been Published the Schedulers and Pencils can then work with Floor Planner and our new Pit Manager application to manage any changes that may occur on the floor - shift by shift. Empower your team members, reduce errors, save time and effort in the scheduling office. Empower your team members – managers and staff – will LOVE our Employee Self Service module! All of the functions above can be turned on or off depending on the specific requirements of your business. Your team members will be able to utilize Employee Self Service using your on-property intranet, externally using the internet and even on their smartphones and tablets! Employee Self Service saves an enormous amount of time and effort for your managers whilst improving employee morale and engagement. Pit Manager is a tablet application designed to easily manage changes on the floor live during the shift. Pit Manager is a tablet application (iOS and HTML5) that enables Casino Pit Managers and Shift Managers to easily manage the floor during the shift. Pit Manager enables Floor Management to use their dealers and tables more efficiently and to communicate with other Pit Managers more effectively.